It’s a fitting juxtaposition: Just as “This Land Is Your Land” was among Guthrie’s more pointed songs, Union is Son Volt’s most overtly political album in nearly 15 years. On a dozen new tunes and a cover, Farrar casts a skeptical eye on late capitalism, addresses the widening gulf of income inequality, imagines and offers a prescription for unity at a fraught moment in a divided nation. Lest the album become a grim political screed, Farrar included a handful of non-topical songs with a different inspiration: his kids. With a son in college and a daughter in high school, the singer was thinking about sending them off into the world when he wrote “The Reason” and “Holding Your Own.” They’re tender songs, from a quietly proud father who is “seeing them go into adulthood and just thinking about the trials they will face, and hoping they don’t fall and press onward,” Farrar says. Farrar and Detering arrived at the Woody Guthrie Center in the morning on a Monday, when the museum is closed to the public. It’s not the first time: Guthrie has long been an inspiration to Farrar. The Son Volt leader collaborated on music for a batch of Guthrie’s previously unrecorded lyrics on 2012’s New Multitudes, with Jim James (billed as “Yim Yames”), Anders Parker and ex-Centro-matic singer Will Johnson. Farrar named Son Volt’s 2005 album, Okemah and the Melody of Riot, after the Oklahoma town where Guthrie was born. And like Guthrie, Farrar has consistently written topical songs throughout his career, though in so low-key a way that it often escapes notice. 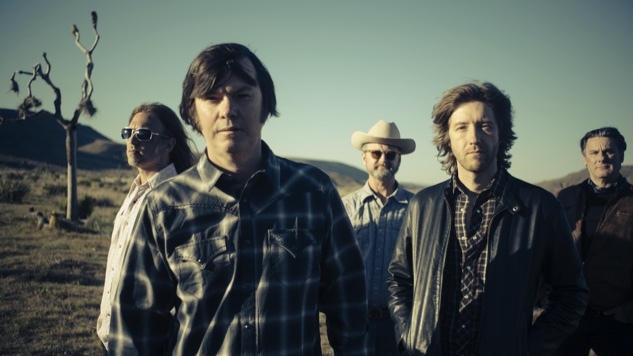 When Farrar reactivated the band in 2004 after a hiatus, Son Volt the following year released Okemah and the Melody of Riot, which included songs addressing the George W. Bush administration in fairly direct terms. Nearly a decade and a half later, Farrar had no second thoughts about another politically minded album. “I think in some ways I’m probably more willing to dive headfirst into topical songwriting, maybe even more so than with Okemah and the Melody of Riot,” he says. On Union, he sounds disgusted on “The 99” at the growing gap between rich and poor, growling electric guitars buzzing beneath his voice; and he’s ready to cast aside distracting frivolities on “While Rome Burns.” Farrar takes on the role of storyteller in the classic folk-balladeer sense on “Reality Winner” and album closer “The Symbol.” The former, a mournful, sympathetic tune named for the intelligence specialist sent to prison for leaking classified information about Russian election interference, mixes guitars and piano as Farrar describes the circumstances around her actions and asks on the refrain, “What have you done?” On “The Symbol,” a dusty, aching acoustic tune, he sings from the perspective of an undocumented immigrant facing the prospect of ejection from the land of immigrants where he—and his American-born children—have made a home. Son Volt’s ‘Union’ will be released on Friday, March 29th. Visit your local indie record store to pickup a limited edition copy of the album pressed on opaque mixed maroon vinyl. These copies include an 11 x 11 screen print signed by Jay.